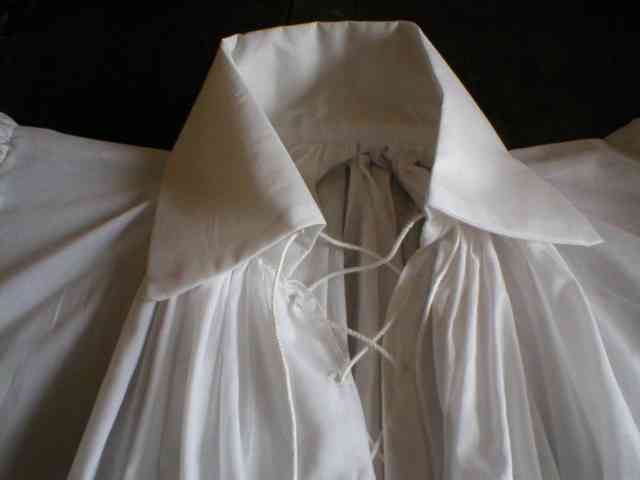 Strong, sturdy and authentic hand-made period shirts, C17th style, for pirates, soldiers, officers, performers: for folk music, scottish dancing, fabulous with kilts and - apparently - great for stilt walking. We've had a bit of a hiatus from making shirts, as our chief tailor ("take a bow, Lucy!") has been out of action, but now we're hopefully all back on track. Orders are already rolling in (*laughs*), so we'll be updating the site soon. Who knows, we might even get that downloadable pdf sorted! Such a simple requirement, you would have thought - all I want is to be able to put the pdf of the order form on the "how to order your shirt" page, and the "how to measure yourself for a shirt" page. It is turning out to be not-trivial. Still, not all bad news: fabric orders are arriving, and I have just unpacked a beautiful new roll of fabulous creamy calico, mmmm, lovely and crisp! We've been having trouble with domain hosting, and even though we have our own bought and paid-for domain name, www.shirt-maker.co.uk, rotten old NTL will no longer allow it to link to the webpages which we spent hours writing and validating. Nooo, not bitter at all. So for the meantime, we're using the Blogger platform as our shop-front, so please accept our apologies if a few things don't work properly yet. Like the pdf of the order form, for example, which just won't work!! We've had to put a link to the relevant page on the ntl webpage, clumsily titled as it is, but we're working on it. Yes, we are still making shirts, and yes, we still have a couple of ready-made ones for sale: we will get things up and running on here just as soon as we can.